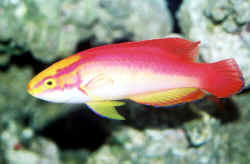 Cirrhilabrus jordani male by Hiroyuki Tanaka. Good Evening Bob and Team! As always, thank you in advance for your wise words and advice. I write to you tonight to ask about a new fish I have in my 60Gallon QT. I noticed when acclimating the fish was kind of “floating” but not like a regular fairy wrasse, it was what looked like early signs of a swim bladder issue. Anyways, he’s eating and moving around and is able to duck into pvc at the bottom of the tank, but is swimming weirdly. I have attached a video for you to see. I’ve read it can also be a digestive system blockage, so I dosed some magnesium to induce passing of any blockage. I am contemplating bifuran treatment to tackle any bacterial infection that may be causing the swim bladder issues. Anyways, I’d like your opinion on what it looks like and what you think I should do please! The video is not the best, but if you look in the acclimation box, that’s him fluttering around. At some point I’ll have the guts to no longer QT these fairy wrasses but this is another instance where I’m glad I did because his DT tank mates would have definitely given him a hard time on top of these swim bladder issues. I’ll speak to the LFS and see if I can get a credit. I hate when this happens to beautiful fish like this, and all fish really, especially because of collection...poor thing. the fish seem to like it. Read that it is pretty good but will switch to Hikari. Bob! Also, some hesitantly and cautioned good news! I’ve had the wrasse in magnesium chloride and BiFuran for two days now, with 100% W/C daily. He’s looking wayyyy better! Take a look at the video. Today I only dosed the BiFuran. He’s eating frozen, NLS pellets and flakes! He’s swimming around with more purpose and stays horizontal and on more control. He even spit some water out of the hospital bucket I have him in. Crazy! I will continue with the BiFuran treatment for the full seven days and report back. Let me know what you think about the video...Hope I’m not overly excited for nothing. Follow up question is how can you determine if the Goldbar wrasse is a male or female? <Yes; well, I can... can you? Females are blah compared to males (which they can, do turn into in time). I've read they need another female present to change into a male. so if I have a single Goldbar that is female it should turn into a male? Thanks for this wonderful website and all the help you have give me in the past. and a 4 inch long Pinstriped Wrasse. Recently I added a small Canary Wrasse into the mix. Every since I added the Canary Wrasse into the tank, he had bury himself under the sand. I only saw him swim out once but was quickly bury himself back under the sand after chased by the pastel green wrasse. Is there anything I can do to help him come out more often. I have not seen him eat for a week now and am very worry that he might not last long without eating. I have tried to catch the pastel green wrasse out of the tank and rearranged my live rock, but catching the wrasse was proved to be next to impossible. Will he eventually come out after a while? First off, your site is terrific. I can always find an answer for my questions. Until now...I have an 80 gallon and recently our rock fell due to our very busy engineer goby. We decided since everything fell to rearrange the rock and add some new pieces. I have several wrasses; a green Coris, an eight line, a multi color, and a canary. I have heard they don't get along, but mine get along well, except occasionally the green will chase the canary for a few seconds. Anyway, we had to get the rock back in since all the corals were just in a holding bin and the temperature was beginning to be a problem. My multi color was out, but my canary and green wrasse were still buried. They typically bury right at the front but since the rock was all out I was not sure. If a rock was placed on top of where they were buried could they still unbury themselves? I have about 3 inches of live sand on the bottom. Thank You! Thank you for your response! The canary has appeared, but the green Coris is still MIA . I guess its wait and see. 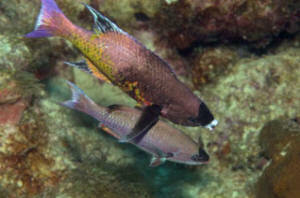 Are you able to tell me anything about the behavior of these two Creole Wrasse? I have named the image, "Caregiver," but that's my creative title. See link to article about why I chose this title. Thank you for replying so quickly, Bob. I guess I would have preferred that he was taking care of the Female. Well, in a way he is. I always learn so much beneath the sea! <Ahh! As do I. Thank you for sharing your photo of Clepticus parrae, input. I noticed if I come to the tank he would swim in front of me doing it if I move to the side he follows me still doing this sort of dance before flicking its tail, this activity has increased now there is a large crater in the substrate & it looks like its been snowing in my tank with corals & rock covered , do I need to be worried ? he looks healthy & eats well. bob Lloyd.